With our super bright LED lantern, you won’t be powerless in an outage. 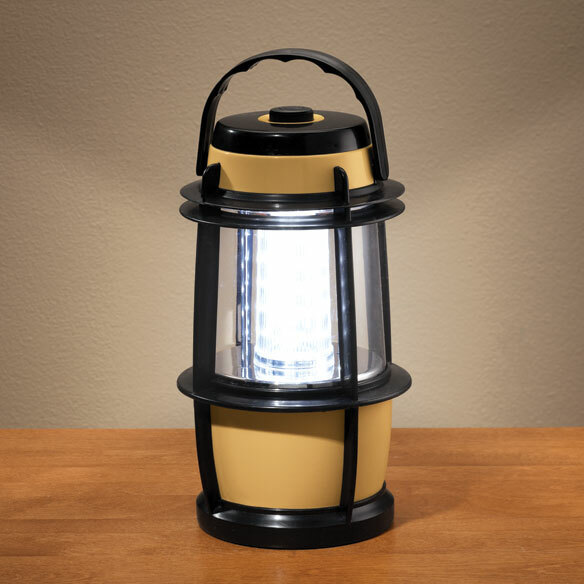 Durable cordless LED lantern features 20 long-lasting LED bulbs for 360° illumination. Lightweight with fold-down carry handle, easy-on/off and dimmer switch. Requires 3 D batteries (not included). 9"H x 4 3/4"dia. I purchased this "20 LED Super Bright Lantern with Dimmer" for when were having brownout/blackout. This lantern is so bright! I love it! I would buy this lantern again. I used it when we had a power outage a while ago. It was so wonderful that I bought one for each of my kids. We purchased this as an emergency light. We've not had to use it for that yet, but have checked it out and like what we see. Using this product for when lights go out. Bought one for my parents and myself. Like it because it gives light 360°. Very useful as a portable night light that can be dimmed. Can be set down any where. Provides a good amount of light. Kids can enjoy in homemade tents. I used the lanterns for our tailgating game on the tables. Great price, enough light, easy to carry, lightweight. We purchased several of the lanterns for our grandchildren. Those that received them are happy with them. Good for when Lights go Out!! Will be useful when the electricity goes out in the winter. Also can be used in summer outside when it is getting dark. This product is very useful for emergencies. I love it..
Well it's okay, if your not moving the item around, it started to blink when moving the object around the room. But other then that it does the job okay. It's very bright in the dark. I'm glad it does have knobs to turn on & off and it has where you can turn it down,dimmer to bright. If I knew how to stop the blinking, then I want to buy more of them. Thanks! I like the way the light can be adjusted from dim to bright. The batteries have a tendency to fall out of place real easy, nothing to hold them in place due to the weight of the "D" batteries. Just in case, for the next hurricane. We live in a hurricane area and need good lighting when all our power goes out. This is a great size, and the price was wonderful. If I find that the lighting is as good as they say it is, I plan to buy several more and will also tell my friends. Hope that it is big enough. Blackouts occur here. just in case of a power go out. Live in windy area and sometimes lights go out! I need super bright lanterns. Price was a steal. Just ordered 3. Can't wait to receive them. I already have two of these,and wanted one for my Grandson to have for his room. The price was right and the product description was just what I am looking for.